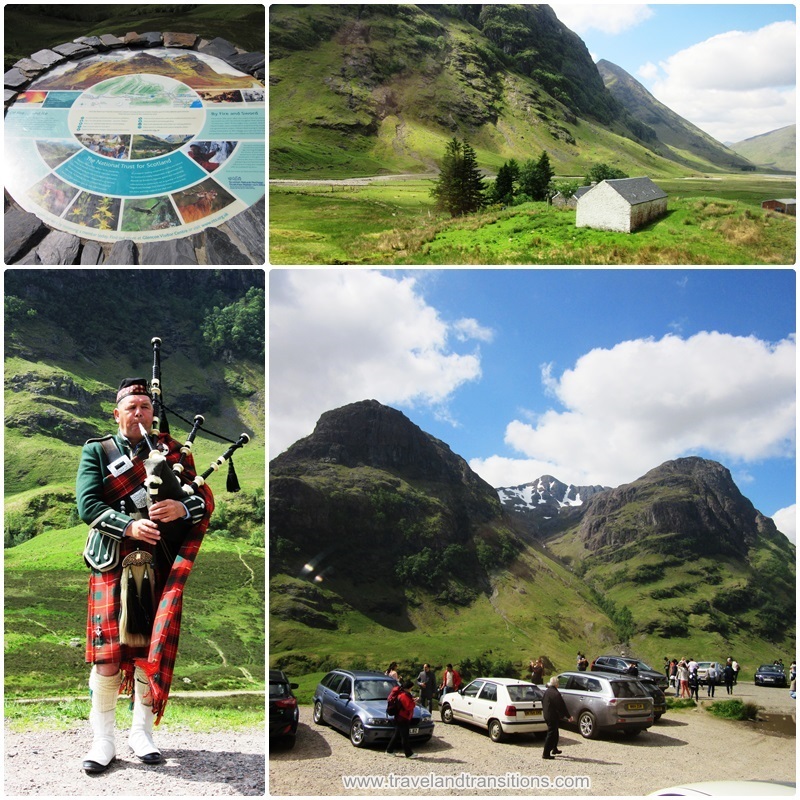 During our day trip across the Scottish Highlands we stopped at the Three Sisters, three spectacular peaks that are located in Glen Coe, a long deep valley of volcanic origin that is all part of the National Scenic Area of Ben Nevis and Glen Coe. We were promptly welcomed by a bagpiper who was playing traditional Scottish tunes. Although the valley is named after the River Coe, the name of this valley is often said to be “Glen of Weeping”, in reference of the tragic Massacre of Glencoe. In the aftermath of the Glorious Revolution and the Jacobite Uprising, 38 members of the MacDonald clan were killed in 1692 by members of the Campbell clan. The Campbells had been staying as guests who had enjoyed the MacDonalds’ hospitality. The MacDonalds were killed because they supposedly had not pledged allegiance fast enough to the new monarchs, William and Mary. After their homes were burned, another forty MacDonald women and children died of exposure. Scottish history is very dramatic. One of the most famous and scenic valleys in Scotland, Glen Coe today has become a centre of outdoor tourism for hikers, mountain bikers, and paddlers. 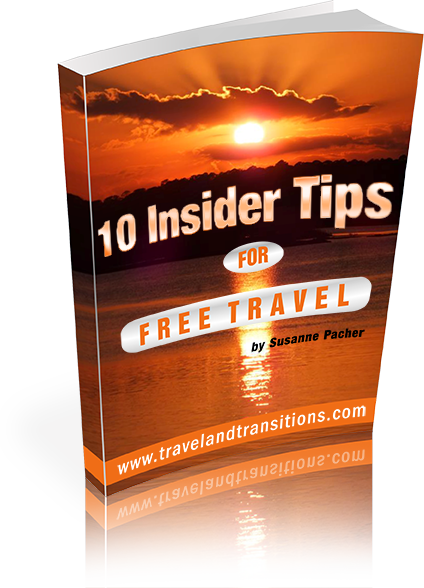 You can even play golf in the area, explore it in a Landrover safari or take a course in landscape photography. 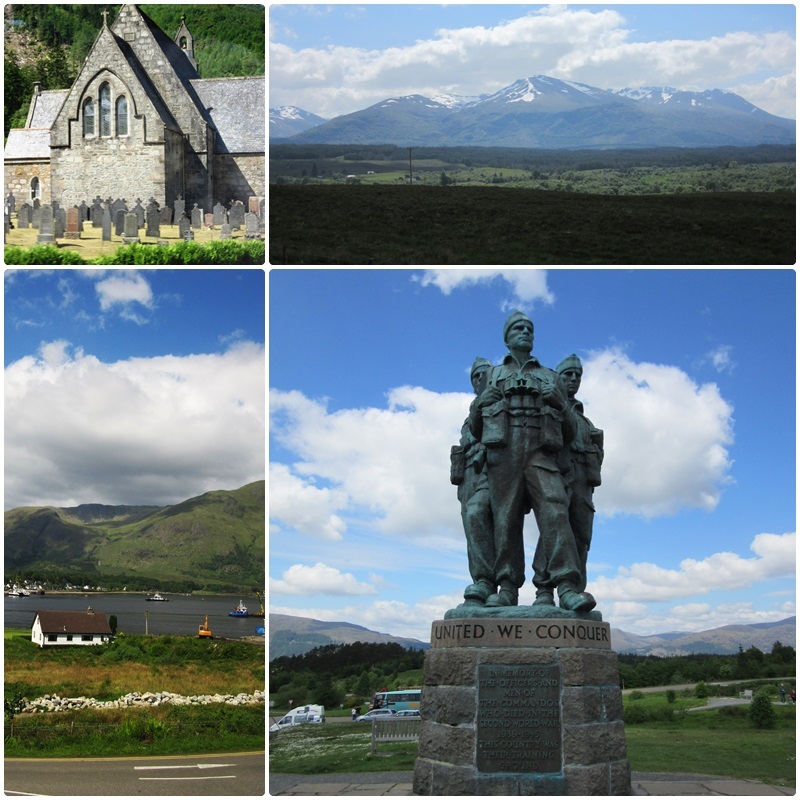 After another scenic drive across the Scottish Highlands we made our next stop, this time near the village of Spean Bridge, where we admired the Commando Memorial, a bronze sculpture that is dedicated t the original British Commando Forces of World War II. Located about a mile from the village of Spean Bridge, this memorial overlooks the training grounds of the Commando Training Depot that was established in 1942. The location also provides a fantastic view of Ben Nevis – at 1,344 metres (4,409 feet) the highest mountain in the British Isles. Ben Nevis is ascended by about 100,000 climbers every year and the 700 metre (2,300 feet) cliffs of the north face are extremely popular among rock climbers and mountaineers. This imposing mountain is actually the collapsed dome of an ancient volcano. The meteorological observatory at the top of Ben Nevis was built in the late 1870s and is still one of the most important weather stations in the Scottish Highlands where weather can be notoriously variable and dangerous. At the foot of the mountain, the Ben Nevis Distillery has been producing single malt whisky since 1825 and is one of Scotland’s oldest distilleries. Our tour of the Scottish Highlands took us to another iconic site: Urquhart Castle, at one time one of Scotland’s largest castles. On this brilliant day, our Timberland tour bus pulled into the parking lot from where we already had a magnificent view of Loch Ness, surely the most famous of all lochs (lakes) in Scotland. Some of us exited the bus to explore the Visitor Centre at Urquhart Castle while the rest continued on to embark on a longer boat tour of Loch Ness. 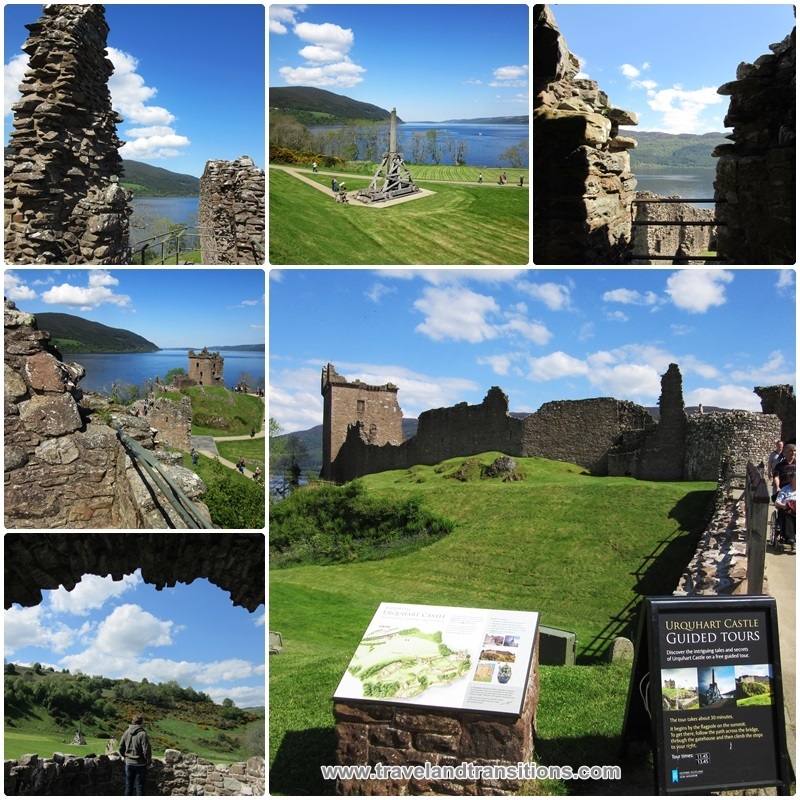 The Visitor Centre illustrates the long and turbulent history of Urquhart Castle. Even during early medieval times, a fortress had already stood here while the present ruins date from around the 13th to the 16th centuries. This castle played a part in the Wars of Scottish Independence and later became a royal castle. During the 15th and 16th centuries, the castle was frequently raided. In 1692, Urquhart was partially destroyed to prevent it from being used by Jacobite forces, and since then the once imposing castle has been left to decay. With its breath-taking location and its historic significance, Urquhart Castle today is one of Scotland’s most visited places.